One of the more common reasons for a property to become damaged is plumbing problem. The bathroom and the kitchen are the most vulnerable of all the regions in any house. Ms. Jackson is one of those who have suffered through a leak in her bathroom, a very inconvenient predicament as everybody knows. Despite how cumbersome the situation may have been, InsuranceWorks.ie was able to solve the problem in the most efficient manner. The problem was discovered when Ms. Jackson noticed that her bathroom sink was leaking. Ms. Jackson sought professional help immediately after finding the leak especially since plumbing problems can lead to significant water damage when allowed to develop over time. Ms. Jackson was able to chance upon one of InsuranceWorks.ie's vans as it was parked in the Clondalkin area which allowed her to call up the Clondalkin Plumbers straightaway. 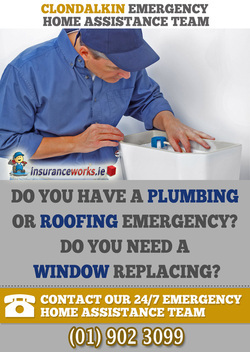 Upon arriving at the property, the InsuranceWorks.ie's plumber was able to find out from his evaluation that the leak had actually gone all the way to the vinyl floor and soaked the floorboards that were found underneath. This, in turn, damaged the kitchen ceiling which was immediately below the bathroom. We all need emergency assistance at one time or another. Here are a few stories of the people we have helped.